Over the last few weeks I have had numerous conversations with teachers wanting to save time and it is one of my beliefs that technology should assist with this time saving. At the same time as I have been having these conversations, I’ve also been teaching my classes. Last week I was teaching (or revising?) with my year 9’s on good graphing technique, starting with a hand drawn graph in OneNote. I found myself using the inbuilt grid line background in OneNote, counting the individual squares to make my scale – and without my glasses on this turned out to be very painful in front of the class. I don’t think the students really noticed, but afterwards I reflected that there had to be a better way, that saved me that time. And stress. 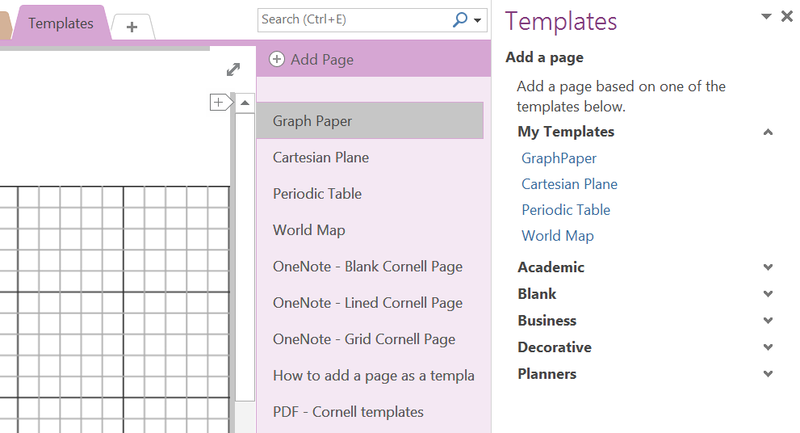 It prompted me to have another look at the templates in OneNote and not finding the one I wanted (traditional graph paper with every fifth line a slightly thicker), I set about making my own. I realised, that with templates, here was a perfect example of a technological tool that is a teaching timesaver. Having templates, organisers and backgrounds available at a stylus click means we can use the tools straight away – and reduce the cognitive load of both teachers and students. You can read more about my thoughts on images and reducing cognitive load in this article. I make most of my template images in a graphics package outside of OneNote (Microsoft PowerPoint and Adobe Fireworks are favourites of mine), then save the image as a PNG file. Sometimes I also make the graphics within OneNote, then screen capture the OneNote page using the clipping tool, and then save the clipping as a PNG (just right click on the image, and “Save as”). The final way to get the template graphics is to find and download them on the web – using royalty free images are the best bet. Once you have the graphic, making the page that will become the template is super simple. Hint: If the “Set Picture as Background” is not available, it means that the image is in a OneNote table cell. To fix this, select the image (not the cell) and cut it (CTRL & X). Now select the OneNote cell and DELETE it. Finally, paste the image (CTRL & V) and now when you right click, the option to “Set Picture as Background” should be available. If it is not, you probably cut the picture and the cell. Try again! The final step is to turn the page into a template page. Again this is really simple. From the INSERT menu, choose “Page Templates”. A new menu opens to the right. At the bottom right of the new menu, there is an option to “Save current page as a template”. Select this, give your template a name (I usually use the same name I gave the page) and save. Now whenever you want your template it is available in three clicks. Click your template at the right. Your own technological teaching timesaver tool. Previous So you want to record some audio? Two missed tips!